We've set up this special area to sell Nitrozac's paintings directly. We've heard from several folks who don't like auctions for various reasons, so this will give them a chance to get an original Nitrozac in a simpler way. Nitrozac also does custom work on commission. If you do have something you'd like her to paint, please just let us know and we will get back to you on options and prices. 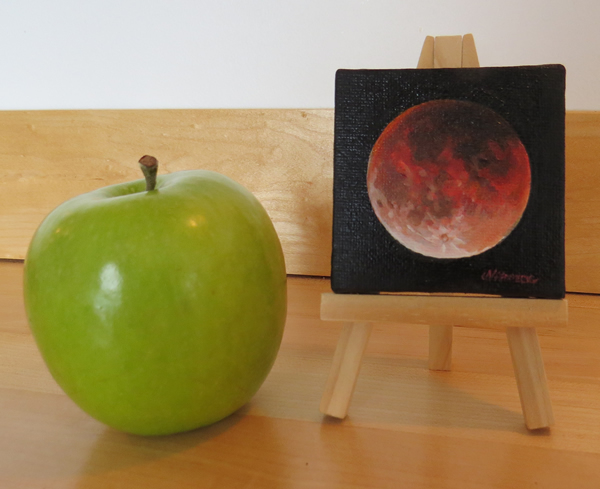 I'm pleased to present to you for auction my painting "Lunar Eclipse", depicting a total lunar eclipse. You probably know this, but a lunar eclipse occurs when the Moon enters the shadow of the Earth. To achieve a total lunar eclipse, the alignment of Sun, Earth, and Moon must be such that the Moon enters fully into the deep shadow cast by Earth. This happens once every 2.5 years or so, and it is a beautiful sight to behold, as often the Moon takes on a deep reddish color. 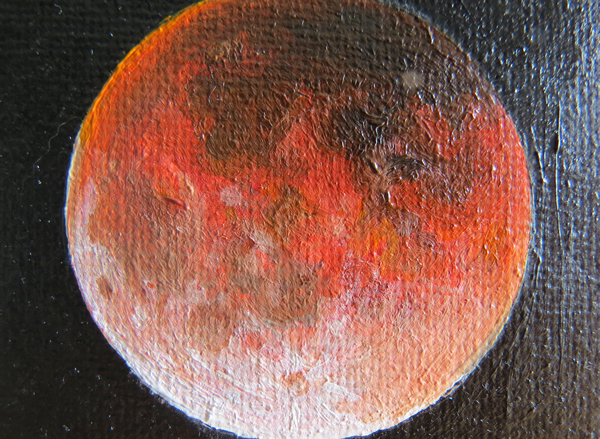 A lunar eclipse may be viewed from anywhere on the night side of the Earth, this particular eclipse I've painted was viewed on the evening of September 27 2015, from Vancouver Island, British Columbia, Canada. This painting was a delight to work on. 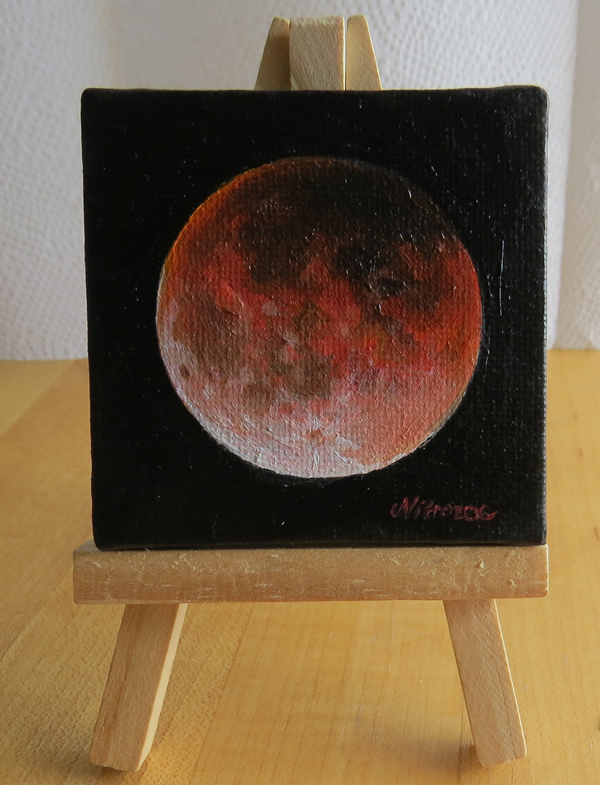 Despite being small, I think it really captures the majesty of a lunar eclipse. Its demure size makes it more personal, like a memory you can tuck away into a pocket. Every time I look at it, I remember the feeling of wonder I have seeing our gorgeous moon turn a deep red color, and seeing all the stars beside the Moon that are usually lost in the glare. During a lunar eclipse, one really understands that there's a planet out there! This sense of wonder about our solar system is a feeling we too often forget, but with this little gem in your life, it is only a glance away. I know the new owner of this delightful object will enjoy it as much as I do. NOTE: This painting is now sold, but Nitrozac can paint a newer version of it if you like! Nitrozac is also available for custom painting commisions. Please e-mail for more information.